Keep your vehicle running right by keeping up with the periodic maintenance your vehicle manufacturer recommends. When something is not right, we can help get you back on the road with the right repair solution. Choose from a wide selection of tires from trusted brands like Bridgestone and Firestone. We offer a complete scope of automotive repairs for your vehicle. Our specialty is using state of the art technology to quickly identify and resolve issues. Our mechanics know what is best for your car and your wallet! Let us help you save money by setting up a personalized preventative maintenance plan to stop problems before they occur. 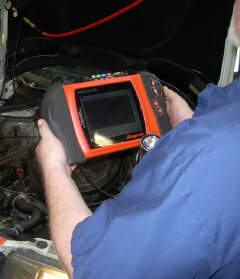 Our technicians expertly perform state defined vehicle inspection and emissions testing. Change the oil with up to five (5) quarts of quality motor oil. Replace oil filter. Check and top off the following fluids: transmission fluids, differential fluid, power steering fluid, windshield washer fluid, battery water (excluding sealed batteries). Not Just for your Car!